We didn't have a spring where we are, here in Minnesota. Didn't see the sun hardly for three months, rain and snow - directly to balmy summer in about a week. Yes Diners it is Nov 1 and 74 in Boston today. This used to be a freak and now is common place, been warm all week, mid sixties, and 70's forecast again for tomorrow. Agelbert has no doubt got it right Diners imo. Know very little about these matters; but I have lived in Boston my entire life and can say with certainty, something is very different and amiss about the weather of the last few years. My trees still have most of their leaves and they are coming down fast now with any sort of wind but they used to be about bare by now. My home heating oil tank is still over three quarters full, and I usually get my first delivery this week. At nearly four bucks a gallon I am not crying but have a feeling I should be. Hardly give any more of my time to the Peak Oil arguments, we have a much more serious problem to contend with right now. "Today"
Even in Texas we used to get a little frost on the pumpkin by Halloween. Not this year. It sounds like our weather is not that different than yours at the moment. We are having a wet fall, which is of course quite welcome. The weather here is about like coastal California right now. Likely my microclimate is a bit colder than what some of you are seeing. It is still plenty freaky though. My first frost this year was early in the first week of October. Last Wednesday it barely got above freezing and i ran the wood stove all day. Today the high temp was a balmy 64F, but last Nov 1 i had almost two feet of snow on the ground from the Haloween storm, but no frost before that storm. New England weather has always been a bit weird though. Before today, over at the NOAA records center, heat records were running way below last year to date, and cold records running way above, with the heat records still keeping a slight overall edge. Today that page (i tried several times) was not accessable, probably because of the overwhelming number of new heat records. IMO what is going on "big picture" is unclear, with the warming side of things generally getting more press, but actual warming lagging all of the climate models. The dramatic weather swings are hurting farmers worldwide. Solar activity is dramatically lower, but there is still more warmth than i can explain, even giving credit to the ocean "flywheel effect" and RE's geotectonic heat transfer idea. Perhaps we are missing a factor or two?? Perhaps CO2, while not causing the expected runaway heating, is mitigating what might otherwise be global cooling by now?? MANILA — Up to 1,200 people are believed dead after Super Typhoon Haiyan — one of the most powerful storms ever recorded — slammed into the central islands of the Philippines, the Philippine Red Cross said Saturday. That death toll estimate, made by Gwendolyn Pang, secretary general of the Philippine Red Cross, comes from what the relief organization's workers have been reporting in the field, Richard Gordon, CEO of the Philippine Red Cross, told USA TODAY. As Haiyan heads west toward Vietnam, the Red Cross is at the forefront of an international effort to provide food, water, shelter and other relief to the hundreds of thousands of residents who have lost their homes and livelihood, Gordon said. "This is a big, full-court press," he said. "We're pulling out all the stops to help." With widespread power outages, roads blocked, bridges down and debris strewn everywhere, getting life back to some semblance of normal in the region will take time. "The Philippines are always resilient, and we're going to get back up," Gordon said. 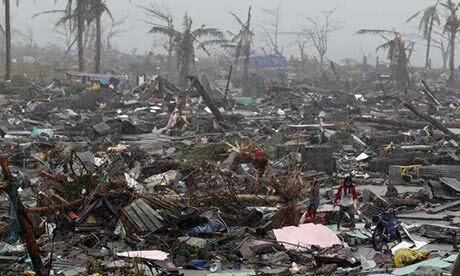 Because communications in the Philippines were cutoff, it remains difficult to determine the full extent of casualties and damage. "We expect the level of destruction caused by Typhoon Haiyan to be extensive and devastating, and sadly we fear that many lives will be lost," said Anna Lindenfors, Philippines director of Save the Children. "With this magnitude we know that the destruction is overwhelming," said Emma Amores, who was waiting outside Villamor Airbase in Manila, where a C-130 was loading relief supplies and personnel heading to hard-hit Tacloban. "From the images we saw on TV, it's highly likely our houses are gone. We just want to know that the family are all safe." Romil Elinsuv, who is in Manila for work training, worried about his wife and 4-year-old son who are at their home in Palo, a town in the province of Leyte. "I feel fear. I don't know what the situation is there," Elinsuv said. He said he spoke with his wife the day before. She assured him they were OK, but then the line went dead, and he's been unable to reach her since. Super Typhoon Haiyan hit Guiuan, on the Philippine island of Samar, at 4:40 a.m. local time Friday. Three hours before landfall, the Joint Typhoon Warning Center assessed Haiyan's sustained winds at 195 mph, gusting to 235 mph, making it the fourth strongest tropical cyclone in world history. The warning center uses satellites to estimate the wind speed of typhoons and hurricanes. Satellite loops show that Haiyan weakened only slightly, if at all, in the two hours after JTWC's advisory, so the super typhoon likely made landfall with winds near 195 mph, reports meteorologist Jeff Masters of the Weather Underground, a private meteorology company. This is equivalent to a strong Category 5 hurricane. Weather officials in the Philippines, using other methods of measuring wind speed, said Haiyan had sustained winds of 147 mph with gusts to 170 mph when it made landfall. By those measurements, Haiyan would be comparable to a strong Category 4 hurricane. As of early Saturday morning U.S. time, Typhoon Haiyan has winds of 120 mph, gusting to 150 mph, which is equivalent to a Category 3 hurricane. The center of the storm is located well to the west of the Philippines in the South China Sea, about 467 miles from Da Nang, Vietnam. It's expected to hit Vietnam on Sunday. "The evacuation is being conducted with urgency," disaster official Nguyen Thi Yen Linh told the Associated Press by telephone from central Danang City, where some 76,000 are being moved to safety. 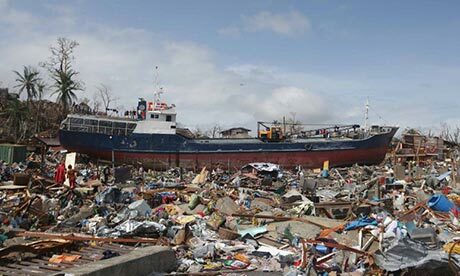 Typhoon Haiyan - one of the most powerful storms ever to make landfall - has carved a path of death and destruction through the central Philippines. Here in Tacloban at least 100 people were reported killed. "one of the most powerful storms ever to make landfall"
"one of the most powerful storms OF ALL TIME ever to make landfall"
Did you guys miss my Supertyphoon post from ZH? Bigger than Katrina and Sandy COMBINED! We are getting Big now. REALLY BIG. BIBLICAL BIG! It has been a lot like May so far this November in Beantown. The unseasonably warm weather will continue today through most of the weekend before colder, dry air returns next week. The weekend will be mostly pleasant and dry, but some heavy showers could arrive late Sunday, according to the National Weather Service. Today will be mostly sunny, with a high near 60. A southwest wind will bring gusts up to 25 miles per hour. Winds will slacken through the day and clouds will thicken through the evening, according to the weather service. Temperatures will fall into the low 40s overnight. Saturday will be partly sunny, with temperatures reaching the upper 50s. A few showers could come to the southern coast. Clouds will dissipate through the day, and skies will be mostly clear overnight, as temperatures fall into the mid-30s. Sunday will be mostly cloudy, with a high climbing near 60. Conditions will remain dry through the day, but showers are likely late in the day. Temperatures will fall into the low 50s overnight, according to the weather service. Showers will continue Monday, mainly between 11 a.m. and 3 p.m., and temperatures will crest above 60. The day will be breezy and cloudy and shouldn’t clear up much overnight, according to the weather service. Showers are possible overnight Monday, and temperatures will fall to around 40. The heck with the markets and Doom. Going down to the local lake and listen to some music in the auto and take a walk. Beautiful totally blue sky, no wind, like a day in early June except it will dark at 4:30. Anyone who doesn't think the weather is crazy sure hasn't been in Beantown this month. It was warm and downright muggy here yesterday. I worked in my garden for a change. Carpe diem, Goldfinger. Finished my daily walk around the neighborhood a while ago - wearing a T-shirt and gym shorts. Still, I was perspiring a little on the 2nd lap. Checked the local Newz weather page and it was registering 79 degrees...on December 22nd. Crazy weather in NC today.